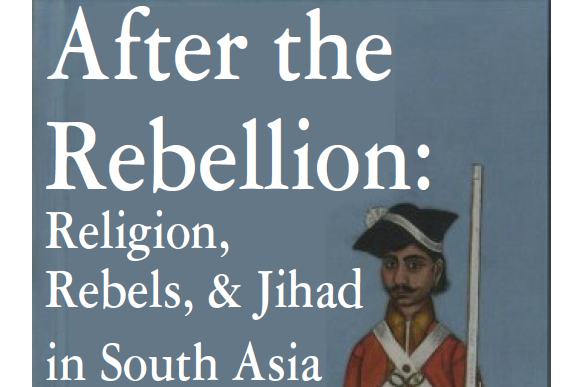 Religion, rebels, and jihad were redefined in the aftermath of the 1857 Rebellion in South Asia. What it meant to belong to a particular religion-specifically Islam-came to signify one's political leanings. In turn, religious concepts with long, multifaceted histories-specifically jihad-came to be synonymous with a religion and its religious community. This talk addresses how the events of 1857-1858 minoritized and racialized Indian Muslims, with particular attention to the use of jihad as a rhetorical concept in the colonial period. Professor Ilyse Morgenstein Fuerst specializes in religions of South Asia. Her research deals with Islam in South Asia, historiography, and the development of theories of religion. Other areas of interest include how religion has been defined and relates to both nationalism and colonialism. She earned her B.A. in Religion from Colgate University in 2005, an M.T.S. at Harvard Divinity School in 2007, and a Ph.D. from the University of North Carolina at Chapel Hill in the Islamic Studies concentration in the department of Religious Studies in 2012. Supported by a major Humanities Futures grant from the Mellon Foundation.